COLLEGE PARK, Md. – With more than 300,000 new cases per year, according to newly revised estimates from the CDC, Lyme disease continues to be a persistent threat to public health in the United States. Yet a vaccine to prevent the often devastating complications of human infection is still unavailable. 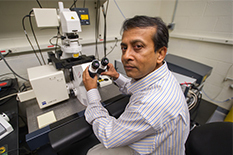 Dr. Utpal Pal, an associate professor from theDepartment of Veterinary Medicine at the University of Maryland, has been on the front lines in the war against Lyme disease for the last five years and is considered a worldwide leader on the subject. This year, the National Institutes of Health (NIH) awarded Pal $1.5 million to continue his quest to eradicate Lyme disease. Pal and his research team first began studying Borrelia burgdorferi -- the bacteria that causes Lyme disease – at the University of Maryland in 2006, and received an initial $1.5 million research grant from the NIH in 2009. Since then, Pal and colleagues have learned a lot about this curious bacteria that can adapt to and survive in a variety of different hosts including deer ticks, mice, dogs and humans, who contract the bacteria from deer ticks. "Borrelia is so interesting because it doesn't actually produce any toxins that we know of but induces an immune response in the body that causes inflammation," says Pal. "It also looks different inside each host it infects." Inside his state-of-the-art lab, Pal's team grows Borrelia in test tubes, genetically modifies the pathogen, and uses it to infect ticks at different stages of development to figure out which components of the bacteria help it to survive. Pal is credited with identifying a number of proteins that contribute to Borrelia's robust nature and pinpointing genetic markers that could serve as new targets for diagnosis and prevention of Lyme disease. In this next phase of research, Pal and his team will work to further understand the biology of Borrelia and host responses during infection with the ultimate goal of creating a human vaccine. Additionally, Pal is interested in developing a rapid, low-cost and reliable point-of-care test for infection. Currently, Lyme disease is diagnosed through a blood test but the results can take several days and often don't detect the bacteria in low levels at the initial stage of infection. "It's very important to invest time in diagnosis of Lyme disease because the sooner you know you have it, the easier it is to treat," explains Pal. If left untreated, advanced Lyme disease can cause serious complications such as arthritis, facial paralysis and heart palpitations. A visiting assistant professor from Ondokuz Mayıs University in Turkey, Dr. Ozlem Buyuktanir, recently spent a year in Pal's lab and was able to create a prototype for a diagnostic test which can be executed at a doctor's office within a few minutes using a patient's blood sample. Pal and his collaborators plan to seek industry partners as well as federal funding to further this part of their research. The most recent grant awarded by NIH will support five more years of Lyme disease research in Pal's lab. Pal and his team are optimistic that their efforts will one day contribute to the development of a vaccine and control the spread of Lyme disease in the United States.